Properties in Pigianos Kampos average 4.8 out of 5 stars. Villa Dafni! Countryside views, walking distance to shops, close to the beach! Property 18: Villa Dafni! Countryside views, walking distance to shops, close to the beach! You relax while we take care of you - Read our reviews and book now! Property 20: You relax while we take care of you - Read our reviews and book now! Property 22: You relax while we take care of you - read our reviews and book now! Villa Vaggelio, Panoramic Views in Total Quietness, Close to the Beach & City! Property 26: Villa Vaggelio, Panoramic Views in Total Quietness, Close to the Beach & City! Villa Chara! Heated pool, outdoor Jacuzzi, gym, ping pong, playground and bikes! Property 29: Villa Chara! Heated pool, outdoor Jacuzzi, gym, ping pong, playground and bikes! Villa Renta Eleni! Country views, private pool, 350 m2 lawn, close to beach! Property 30: Villa Renta Eleni! Country views, private pool, 350 m2 lawn, close to beach! Brand new villa with Private swimming pool close to the beach and the amenities. Property 35: Brand new villa with Private swimming pool close to the beach and the amenities. Rosemary Villa! 45m2 pool, large terrace, walking distance to shops! Property 41: Rosemary Villa! 45m2 pool, large terrace, walking distance to shops! Ioanna & Stavros Villas! Panoramic sea views, pool & privacy, near Rethymno town - Maroulas Villa Ioanna, panoramic sea views, pool & privacy! Property 42: Ioanna & Stavros Villas! 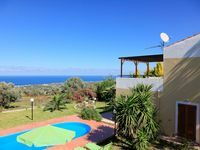 Panoramic sea views, pool & privacy, near Rethymno town - Maroulas Villa Ioanna, panoramic sea views, pool & privacy! Beach 5 meters from the garden, sea view, amenities, quiet, 9-12 people. Property 44: Beach 5 meters from the garden, sea view, amenities, quiet, 9-12 people. Property 49: A wonderful place to stay. Excellent holiday for us, we are glad we booked it! At the time of year we stayed we did not get to use the pool (a heated pool would be nice but before booking the villa we knew there was no heating option). What a great view, was nice to see every morning. my family enjoyed this spacious villa. convenient walks for our coffee.